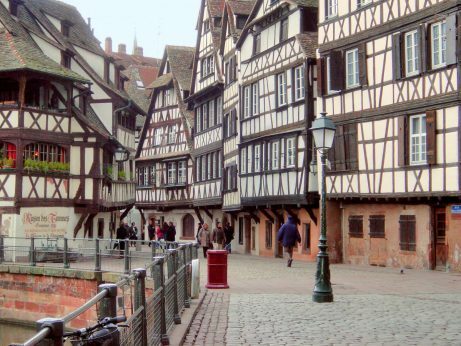 Strasbourg – one of Europe’s capitals – has mirrored the changing fortunes of France and Alsace for hundreds of years. Worldly famous for its towering Gothic cathedral, the city is today home to the European Parliament. 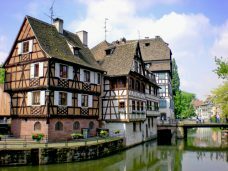 Here is our list of 10 things to see in Strasbourg, Alsace whose old town and cathedral have been listed by Unesco as a World Heritage Site since 1988. It’s always a hard thing to do when you have to list the favourite monuments and sites of a French city. Once upon a time (in the Middle-Ages), the cathedral’s spire was the world’s tallest monument. The first sight of the breathtaking façade is a unforgettable experience, particularly if one comes from the ‘New World’ (Australia, NZ, Canada or the US). Find out more about Strasbourg Cathedral. Built between 1732 and 1742 in sandstone from the Vosges, the Classical-style palace adjacent to the cathedral now houses three museums: the Museum of Decorative Arts, the Museum of Fine Arts, and the Archaeological Museum. Not far from the Cathedral, the lively Place du Marché-aux-Cochons-de-Lait and Rue du Maroquin are lined with several restaurants and winstubs. 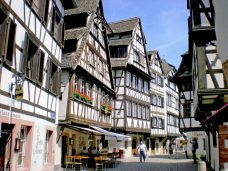 There are magnificent half-timbered houses with wooden galleries. This small district is definitely picture-postcard perfect. The large square is at the heart of the city and also the rallying centre of the Strasbourgeois during great events and celebrations. On one side, it is bordered by the Aubette, a long Classical-style built in 1778. Place Kléber features Strasbourg’s great Christmas tree in December. This is perhaps the most famous district in Strasbourg. You must take the time to stroll along the waterways and appreciate the reflections of the half-timbered houses in the water. The pretty medieval houses of the district date from the 16th and 17th centuries, and half-timbering is magnificently decorated. Their steep roofs are open over the attics where skins used to dry. Find out more about the Petite France district. Beyond the limits of the old town, the new masters of Alsace after the 1870-71 Franco-Prussian War (the Germans!) laid out a brand new town which included prestigious buildings, representative of the power around the Imperial Palace (Kaiserpalast), as well as many public buildings which would become iconic buildings in the city. The Neustadt (New Town) was a combination of many architectural styles: Roman, Gothic, Renaissance, Classical and Baroque. With the rise in power of Art Nouveau in Europe, the style of the new buildings took on Jugendstil, its Germanic version, characterised by the abundant use of floral motifs. Find out more about Strasbourg’s German Imperial District. From the Ill River, the European Parliament Building can be seen along a monumental glass façade which seems to symbolise the spirit of transparency of the European democracy. From the other side, the building’s facade is completely different, and for many, it oddly resembles the ruins of the Colosseum in Rome. The huge glass pavilion leaves no visitor unmoved. The building which was delivered in 1999 had to include a 750 seat Chamber (the largest in Europe), 1,133 offices, work spaces and relaxation areas, as well as adjacent administrative services. Find out more about Strasbourg’s European Destiny. Cooperation efforts between Strasbourg and its counterpart on the other side of the Rhine (the German town of Kehl) led to the creation in 2004 of the Jardin des Deux Rives (Garden of the two banks), spreading on both sides of the Rhine River over 60 hectares. Both sides of the garden are linked by a footbridge and a belvedere in Kehl offers a fine view over Strasbourg, the Vosges and the Black Forest mountains. 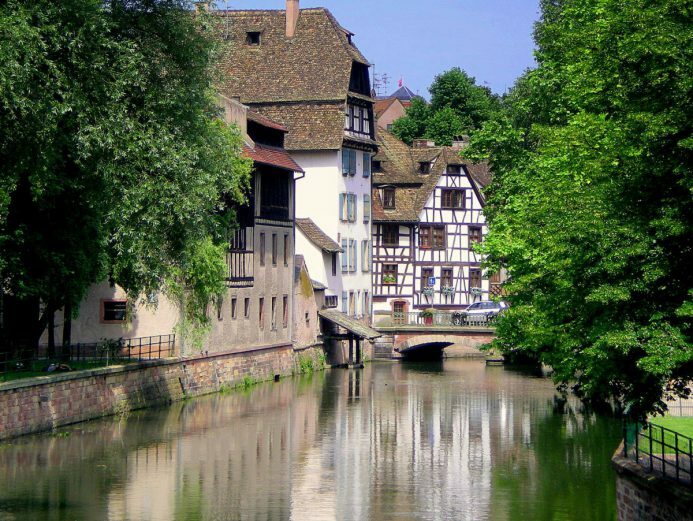 There is a lot more to discover in Strasbourg and its surroundings. The region of Alsace offers beautiful and famous sites: Colmar, the Alsace Wine Route, the Vosges and many more. Next Article “Let them eat cake”… and oysters!